Earlier this morning we were sent slides from what purports to be an internal dealer meeting in Atlanta this month. 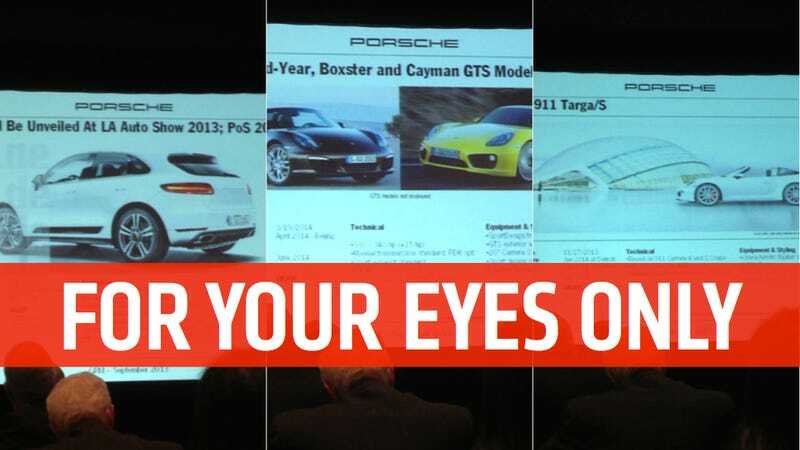 What it reveals is all the important information for Porsche reveals over the next nine months about the Porsche Boxster GTS/Cayman GTS, Porsche 911 Targa, and Porsche Macan. Of course, all of this comes from a single source and hasn't been confirmed for verified, although it sounds fairly on-point, especially the Porsche Cayman/Boxster GTS. It could all be wrong, but it does follow other information we've heard. Can anyone confirm? Was anyone at this meeting?